We have two winners for our 5 Steem per new project giveaway! Multidimensional Presence and E I have joined 2 Million Trees by 2020 and SAFLT on Peer Query. The winners have received 5 Steem each and have their projects posted to our Facebook page. Visit the projects' respective pages to learn more about these projects. We still have 8 more winners to award. If you have any interesting project, kindly consider listing it on Peer Query. While still in development, with your support we hope to build a platform for supporting project authors and contributors. We intend to setup a curation team to curate and reward(votes and promotion) the reports of the best projects. 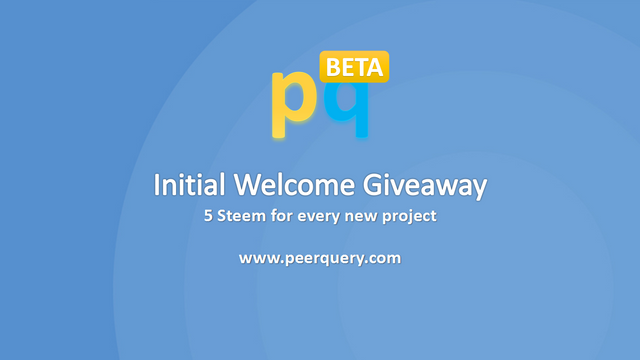 Peer Query Giveaway Updated: win 5 Steem with promotion for a new project! Thank you very much @dzivenu!